The nation’s dual regulatory framework, in which a state may authorize a medical marijuana business to lawfully operate under its jurisdiction but cannot protect it from prosecution under federal criminal law, gives the federal government direct and indirect control over the establishment and development of medical marijuana businesses. Ironically, the federal government has not impeded the progress of state marijuana legalization and the growth of the medical marijuana industry through direct enforcement of the CSA in those states where medical marijuana is legal. Indirect federal regulations restricting access to basic banking services have proved a far greater challenge to medical marijuana businesses. Federalism Battle: Victory for the States? Based on the executive branch’s historical inability to effectively enforce the CSA due to limited resources, and its recent change in policy on enforcement of the CSA in states where marijuana has been legalized, “many are willing to declare that, at least for practical purposes, the marijuana federalism battle has been won by the states.”30 But medical marijuana businesses still face obstacles caused by the government’s indirect regulation of medical marijuana activities and the fact that marijuana remains illegal under federal law. Still, one of the most fundamental and universally acknowledged obstacles facing marijuana entrepreneurs is lack of access to basic banking services.35 The federal government exerts a strong indirect influence over medical marijuana businesses through the laws that regulate banks and other financial institutions. A bank may be chartered under federal law or state law. A bank can choose to be organized under a federal charter issued by the Office of the Comptroller of the Currency (OCC), thereby becoming a national bank.46 Likewise, a bank can choose to be organized under a state charter issued by the applicable banking regulator of that state. Common sense would move us to conclude that a bank may choose to obtain a federal national charter and fall under the regulatory authority of the OCC, subjecting itself to all federal laws, or obtain a state charter from the chartering state’s banking regulator and fall under its regulatory jurisdiction, only subjecting itself to the laws of the chartering state. Therefore, with respect the bank’s reluctance to serve medical marijuana businesses, “[i]f the dual banking system were truly dichotomous . . . the answer for marijuana banking would be clear: state-chartered institutions in states where marijuana is legal would be free to provide banking services to marijuana-related entities.”47 However, as a practical matter, it is virtually impossible for banks and other financial institutions48 to fall outside of the federal government’s radar and regulatory authority, even for statechartered entities. Different federal financial regulators exercise control and oversight of banks through federal deposit insurance, regulation of bank holding companies, and payment systems regulation. All banks, even if organized under a state charter, have to strictly comply with federal statutes and regulations if they want to escape administrative sanctions, such as losing deposit insurance or having their charters revoked, being targeted for federal criminal prosecution, and being assessed hefty civil and criminal penalties. Since marijuana is still illegal under federal law, banks expose themselves to federal law enforcement if they establish commercial relationships with medical marijuana businesses and other marijuana-related entities.49 Compliance with the anti-money laundering statutes and the Bank Secrecy Act, which are enforced by the DOJ, the Financial Crimes and Enforcement Network (FinCEN), and other financial regulators, is driving banks to refuse banking services to marijuana businesses. Because the cultivation, distribution, and use of marijuana are unlawful activities under federal law, it could be argued that when a bank provides banking services to a medical marijuana dispensary and such services allow the medical marijuana dispensary to grow its business, the bank is engaged in money laundering, for which the bank and its employees could be “sentenced to a fine of not more than $500,000 or twice the value of the property involved in the transaction, whichever is greater, or imprisonment for not more than twenty years, or both.”54 A bank may also commit laundering if it “knowingly engages or attempts to engage in a monetary transaction in criminally derived property of a value greater than $10,000,” exposing the bank to the imposition of fines or imprisonment for not more than 10 years or both.55 Hence, a bank that accepts a deposit from, or provides a loan to, a medical marijuana customer in a transaction that is in excess of $10,000, commits a federal crime, exposing the bank and its employees to hefty fines and/or prison time. Since marijuana is still illegal under federal law, the BSA would thus require a bank to file a SAR with FinCEN each time the bank processes a transaction related to a customer that is engaged in a marijuana-related business. FinCEN recently confirmed the foregoing when it issued guidance for banks that desired to provide banking services to marijuana businesses.69 The FinCEN guidance, discussed below, was promulgated to alleviate the banking crisis of the marijuana industry by laying out FinCEN’s expectations of banks and their compliance with BSA requirements if they decided to service marijuana businesses. Such guidance, however, confirms that banks must file reports with the federal government for virtually all transactions for marijuana-related customers and that failure to comply with such guidance and the BSA will expose the bank to civil and criminal liability. In its role as federal deposit insurer, the FDIC is granted supervisory authority over insured banks.75 In practice, nonetheless, the FDIC cedes primary federal supervisory authority over national banks to the OCC and authority over state member banks to the Federal Reserve Board.76 Today, the FDIC serves as the primary federal prudential supervisor for state non-member banks and state savings associations. In that role, the FDIC is the primary safety and soundness examiner for state-chartered non-member banks.77 Thus, the FDIC conducts regular examinations to ensure that state-chartered banks comply with federal regulations and that they are not engaging in unsafe and unsound practices.78 Pursuant to the foregoing, a state-chartered bank becomes subject to federal regulation and to the jurisdiction of the FDIC when it is granted deposit insurance by the FDIC. Also, the Federal Reserve System plays a central role in payment systems of the United States through its Automated Clearinghouse (ACH) payment system.83 Banks access the ACH payment system through the establishment of a master account with a regional Federal Reserve Bank.84 The ACH system is a nationwide network through which banks send each other batches of electronic credit and debit transfers.85 For example, typical ACH credit transfers include the direct deposit of payroll, social security benefits, and tax refunds.86 On the other hand, typical ACH debit transfers include the direct debiting of mortgages and utility bills.87 Therefore, without a master account with the Federal Reserve, “a depository institution is nothing more than a vault.”88 The Federal Reserve can exercise its regulatory power over medical marijuana businesses by imposing barriers to those banks or financial institutions that are serving the marijuana industry and desire to have access to the Federal Reserve’s payment system. The above described regulatory framework demonstrates that, although the federal government has taken a non-enforcement approach with respect to criminal prosecutions of violations of the CSA by medical marijuana businesses, the federal government is still regulating, or at the very least burdening, the medical marijuana industry through its federal anti-money laundering and banking statutes. FinCEN issued guidance clarifying BSA expectations for financial institutions seeking to provide services to marijuana-related businesses on February 14, 2014.89 Such guidance was issued in light of recent state initiatives to legalize marijuana-related activity and related guidance by the DOJ concerning marijuana-related enforcement priorities. According to FinCEN, the guidance clarifies how banks can provide services to marijuana businesses consistent with their BSA obligations, and it aligns the information provided by banks in BSA reports with federal and state law enforcement priorities.90 Therefore, FinCEN intended its guidance to increase the availability of financial services for marijuana businesses.91 As discussed below, the guidance did little to accomplish these goals. Based on the foregoing, if a bank wishes to provide services to a medical marijuana business, it must perform extensive due diligence and background checks into the proposed customer prior to entering into a banking relationship. Thereafter, the bank has to engage in thorough monitoring of such customer’s activities and continually file reports with FinCEN with information concerning the customer’s financial transactions. Failure to comply with any of the requirements of the FinCEN guidance constitutes a BSA violation. Hence, a mistake concerning its enhanced obligations for a bank serving medical marijuana businesses under the BSA could expose the bank to severe monetary penalties and potential criminal prosecution. The principal problem with the federal guidance is that it is not legally binding.119 Agency guidance can be changed overnight without any of the rigorous process that formal agency rulemaking would entail, thus not providing the necessary regulatory stability that banks would like to have if they decide to serve medical marijuana businesses. Another problem is that the DOJ memoranda do not bind prosecutors. These memoranda give prosecutors discretion to prosecute a criminal case and merely recommend that a criminal case against medical marijuana users and businesses should not be pursued if the Cole Memo Priorities are not involved. Also, the 2014 Cole Memorandum provides that banks cannot rely on the guidance set forth therein as a legal defense to a violation of federal law. Specifically, it states that “[n]either the guidance herein nor any state or local law provides a legal defense to a violation of federal law, including any civil or criminal violation of the CSA, the money laundering and unlicensed money transmitter statutes, or the BSA, including the obligation of financial institutions to conduct customer due diligence.”121 Therefore, even if banks are willing to rely on public statements about enforcement priorities, the DOJ’s assurance is not very strong. Technology is also playing a part in the industry’s attempt at providing a solution to the marijuana banking problem. Recently, a software company and a financial compliance firm teamed up to create a software solution designed to assist banks in complying with its due diligence and BSA obligations when serving a marijuana business.135 The venture created a software solution designed to track down marijuana inventory and purchase statistics. Specifically, a barcode and an RFID tag is assigned to a marijuana plant so it can be tracked while it grows, when it is trimmed, packaged as flower or made into a concentrate, placed on the shelf, and bought by a customer.136 The software also evaluates a bank’s BSA/anti-money laundering program and allows banks to monitor a client’s point-ofsale system for any discrepancies or suspicious activity. 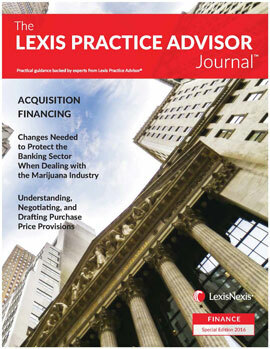 The banks can also monitor whether their clients’ bank deposits match up to their sales and to their total yield, ensuring that its marijuana customers are not trying to launder money.137 The software solution is still in a startup phase as of the date of this article, so it remains to be seen whether this will improve access to banking services. In addition to the attempts to provide a solution to the marijuana banking crisis through the establishment of marijuana financial cooperatives and credit unions such as Fourth Corner Credit Union, no other attempt at establishing an alternative type of financial institution to solve the crisis has been documented so far. Nonetheless, it is very unlikely that the activities of a Colorado marijuana cooperative, a foreign bank, or any other state unconventional banking entity or system created in the future by a state or territory to provide banking services to the marijuana industry, will ever fall outside the federal government’s radar and its enforcement efforts. As previously discussed, the BSA regulates the activities of financial institutions and requires them to assist the federal government in its crusade against controlled substances.138 Recall that the statute contains two catch-all provisions indicating that a financial institution shall also mean “any business or agency which engages in any activity which the Secretary of the Treasury determines, by regulation, to be an activity which is similar to, related to, or a substitute for any activity in which any business described in the [BSA] is authorized to engage” and also “any other business designated by the Secretary whose cash transactions have a high degree of usefulness in criminal, tax, or regulatory matters.”139 Such broad and inclusive language would subject virtually any type of unconventional financial institution to the anti-money laundering and BSA obligations. It would only take a determination from the Secretary of the Treasury that any particular entity constitutes a bank for BSA and anti-money laundering purposes. Many commentators, as well as the banking industry in general, firmly believe that the only solution to the marijuana banking problem is congressional action. As discussed, even though the federal government has announced an apparent hands-off approach when it comes to prosecution of individuals or businesses that use or distribute medical marijuana in states where medical marijuana has been legalized, the federal government still exercises strong indirect regulation of marijuana businesses through the enforcement of its anti-laundering and banking statutes. Such indirect regulation is strong enough to have prevented the vast majority of banks and financial institutions in the United States from offering basic banking services to medical marijuana businesses. The most obvious approach for Congress, but unlikely at this point, would be the outright legalization of marijuana under federal law. Legalization could be accomplished by simply removing marijuana from the CSA. The consequence of outright legalization would be that marijuana and marijuana-related activities would no longer be considered unlawful under the anti-money laundering and BSA statutes, thus allowing banks to serve the medical marijuana industry without the fear of being criminally prosecuted and facing hefty civil penalties. Marijuana could also be rescheduled to a lower Schedule, which would allow the cultivation, distribution, and use of marijuana for medical purposes just as for other controlled substances with medical uses. In a less polemic approach, Congress could amend the antimoney laundering and BSA statutes to provide an exemption from civil and criminal liability to those financial institutions serving state-sanctioned medical marijuana businesses operating in full compliance with their state’s marijuana statutes. The majority of banks admit that the principal obstacle preventing them from providing services to medical marijuana businesses is the fact that they could be exposed to criminal prosecution. Therefore, eliminating the risk of being prosecuted under the anti-laundering statutes and the BSA, and also those costly enhanced due diligence and monitoring requirements associated with the service of medical marijuana businesses, would allow the banks to treat a medical marijuana business as any other legitimate business in its portfolio of clients. The combination of an outdated CSA and pervasive federal banking regulations has interfered with state laws legalizing the medical use of marijuana. Businesses serving medical marijuana patients require access to the same basic banking services that a hospital, pharmacy, and other legitimate medical businesses enjoy. Access to banking and financial services is critical to fulfilling the purpose behind medical marijuana laws in providing care to those with qualifying diagnoses. Legal marijuana businesses should be subject to equal financial scrutiny and accountability as other commercial activities. To do this, Congress must change federal law either by legalizing marijuana for medical purposes or exempting financial institutions from criminal, civil, and administrative liability when serving medical marijuana businesses. Congress has been considering various measures, including making medical marijuana legal under federal law, the protection of anyone acting in compliance with state marijuana laws from federal prosecution, and even specifically protecting financial institutions that provide banking services to marijuana businesses. Without changes in federal law, states are powerless to protect the use, cultivation, and distribution of legal medical marijuana within their own borders. Article courtesy of The Banking Law Journal, Volume 133, Nos. 2, 3, and 4. Copyright © 2016. Matthew Bender & Company, Inc., a member of the RELX Group. All rights reserved. Materials reproduced from The Banking Law Journal with permission of Matthew Bender & Company, Inc. No part of this document may be copied, photocopied, reproduced, translated or reduced to any electronic medium or machine readable form, in whole or in part, without prior written consent of Matthew Bender & Company, Inc.
2015). 38. Id. 39. Serge F. Kovaleski, Banks Say No to Marijuana Money, Legal or Not, N.Y. timeS (Jan 11, 2014), http://www.nytimes.com/2014/01/12/us/banks-say-no-to-marijuana-money-legal-or-not.html. 970273466300; David Migoya, Recreational Pot: Processors of Credit, Debit Cards Relax Rules, denver poSt (Jan. 8, 2014), http://www.denverpost.com/marijuana/ci_24866119/recreational-pot-processors- credit-debit-cards-relax-rules. 43. Abigail Tracy, The Long, Strange Challenge Facing Marijuana Entrepreneurs, INC. (Feb. 11, 2014), http://www.inc.com/abigail-tracy/the-obstacles-facing-potrepreneurs.html. 44. Hill, supra note 14, at 600 (“When the marijuana industry asks federal and state financial institutions why they will not provide banking services, the institutions point to federal law”); see also ameriCan BankerS aSSoCiation, frequently aSked queStionS: mariJuana and BankinG (Feb. 2014), http://www.aba.com/Tools/Comm-Tools/Documents/ABAMarijuanaAndBankingFAQFeb2014.pdf. 45. Kenneth E. Scott, The Dual Banking System: A Model of Competition in Regulation, 30 Stan. l. rev. 1 (1977) (“the ‘dual system’ of both national and state banks and national and state agencies regulating banking is an object of almost universal veneration”); see also Jonathan R. Macy & Henry N. Butler, The Myth of Competition in the Dual Banking System, 73 Cornell l. rev. 677 (1988) (“The American banking system operates under a dual state and federal system of chartering and safety and soundness regulation.”). 46. The OCC charters national banks under the authority of the National Bank Act of 1864, 12 U.S.C. 1 et seq. 47. Hill, supra note 14. 48. This article does not delve into the particularities of the regulatory frameworks related to other financial institutions such as credit unions and savings and loans associations. Credit unions, however, also operate under a dual regulatory system and can generally choose a federal charter from the National Credit Union Administration (NCUA) or a state charter from a state credit union regulator. See 12 U.S.C. §§ 1753, 1752(6). 49. American Bankers Association, supra note 48 (“Financial institutions face significant risk for violating federal law if they offer banking services to marijuana-related businesses.”). 50. Pub. L. No. 99-570; 18 U.S.C. §§ 1956 and 1957. 51. Regalado Cuellar v. U.S., 553 U.S. 550, 550 (2008); 18 U.S.C.A. § 1956. 52. 18 U.S.C.A. §§ 1956 (a)(1)(A)(i) and 1956(B). 53. U.S. v. Arthur, 432 Fed. Appx. 414, 421 (5th Cir. 2011) (unpublished); U.S. v. Awan, 607 F.3d 306, 314 (2d Cir. 2010); U.S. v. Valuck, 286 F.3d 221, 226 (5th Cir. 2002). 54. 18 U.S.C.A. § 1956 (a)(1). We may concede that a bank would be promoting the growth of a medical marijuana dispensary when it provides a loan for the working capital of the dispensary or to expand its operations, or simply by allowing the dispensary to deposit funds with the bank and providing legitimate evidence of the profitability of the bank to potential investors. 55. 18 U.S.C.A. § 1957.144. 56. Currency and Foreign Transactions Reporting Act (popularly known as the Bank Secrecy Act), Pub. L. No. 91-508, 84 Stat. 1114 (1970), codified as amended in 12 U.S.C. §§ 1829(b), 1951–1959; 31 U.S.C. §§ 5311–5330. The USA PATRIOT Act amended and strengthened the requirements under the BSA. Uniting and Strengthening America by Providing Appropriate Tools Required to Intercept and Obstruct Terrorism (USA PATRIOT) Act, Pub. L. No. 107-56, 115 Stat. 272 (2001). 57. Id. See also FinCEN, Mandate From Congress, Financial Crimes Enforcement Network, http://www.fincen.gov/statutes_regs/bsa (summary of Bank Secrecy Act provisions) (last visited May 3, 2016). 58. 31 U.S.C. § 5312. 59. 31 U.S.C. §§ 5312(Y) and 5312(Z). 60. The general civil penalty provision of the BSA is 31 U.S.C. § 5321 and its corresponding regulation, 31 C.F.R. § 1010.820. 61. The general criminal penalty provision of the BSA is 31 U.S.C. § 5322 and its corresponding regulation, 31 C.F.R. § 1010.840. 62. Specifically, the term “bank” is defined to include each agent, agency, branch, or office within the United States of any person doing business in one or more of the following capacities: (1) a commercial bank or trust company organized under the laws of any state or of the United States; (2) a private bank; (3) a savings and loan association or a building and loan association organized under the laws of any state or of the United States; (4) an insured institution as defined in Section 401 of the National Housing Act; (5) a savings bank, industrial bank, or other thrift institution; (6) a credit union organized under the law of any state or of the United States; (7) any other organization (except a money services business) chartered under state banking law and subject to state bank supervisory authority; (8) a bank organized under foreign law; and (9) any national banking association or corporation under the provisions of Section 25(a) of the Act of Dec. 23, 1913, as added by the Act of Dec. 24, 1919, ch. 18, 41 Stat. 378, as amended (12 U.S.C. 611–32).151. 63. 31 U.S.C.A. § 5318(h)(1). 64. 31 U.S.C.A. § 5318(l); 31 C.F.R. § 1020.220). 65. Federal Financial Institutions Examination Council, Bank Secrecy Act/Anti-Money Laundering Examination Manual 56–58 (2014), https://www.ffiec.gov/bsa_aml_infobase/documents/BSA_AML_Man_2014_v2.pdf. 66. Id. 67. 31 U.S.C. § 5313(a); 31 C.F.R. § 1010.311. 68. 31 C .F.R. § 1020.320. 69. Fin. Crimes Enforcement Network, Dep’t Of The Treasury, Fin-2014-G001, Bsa Expectations Regarding Marijuana-Related Businesses (2014), http://www.fincen.gov/statutes_regs/guidance/pdf/FIN-2014-G001.pdf. 70. Jennifer Mann, Chart of the Week: The Challenging Banking Climate for Marijuana Businesses, mariJuana BuS. daily (Jan. 12, 2015), http://mjbizdaily.com/chart-of-the- week-snapshot-of-the-challenging-banking-situation-facing-marijuana-businesses/; see also Danielle Douglas, Banks Are Slowly Welcoming Legal Marijuana Dealers, waSH. poSt (Aug. 12, 2014), http://www. washingtonpost.com/business/economy/banks-are-slowly-welcoming-legal-marijuana-dealers/2014/08/12/01c17960-225b-11e4-8593-da634b334390_story.html. 71. Act of June 16, 1933, ch. 89, § 8, 48 Stat. 168, as amended. This provision, originally codified at 12 U.S.C. § 264, was subsequently withdrawn from the Federal Reserve Act and made over into the separate Federal Deposit Insurance Act, 12 U.S.C. ch. 16, in 1950. See Act of September 21, 1950, ch. 967, § 1, 64 Stat. 873. 72. Federal Deposit Insurance, Understanding Deposit Insurance, https://fdic.gov/deposit/deposits/ (last visited May 3, 2016). 73. Macy & Butler, supra note 49, at 699. 74. Patricia A. McCoy, Banking Law Manual: Federal Regulation of Financial Holding Companies, Banks and Thrifts § 3.03 (Matthew Bender, Second Ed.). 75. Id. See also Hill, supra note 14, at 618 (“With the benefit of federal insurance comes the burden of federal regulation. In order to retain the federal insurance, financial institutions must comply with FDIC . . .restrictions.”). 76. McCoy, supra note 78, at § 3.03. 77. Id. 78. 12 U.S.C. §§ 1820(b), 1784; 12 C.F.R. § 741.1. 79. 12 U.S.C. §§ 1818(b), 1818(i). 80. 12 U.S.C. § 1818(A). 81. 12 U.S.C. § 1818. 82. 12 U.S.C. §§ 324, 330; 31 C.F.R. § 1010.810. 83. Federal Reserve Bank Of San Francisco, What Is the Fed: Payment Systems, http://www.frbsf.org/education/teacher-resources/what-is-the-fed/payment-services (last visited May 3, 2016 (last visited May 3, 2016). 84. Federal Reserve Bank Services, Master Account https://www.frbservices. org/servicesetup/account/master_account.html (last visited May 3, 2016). 85. Board Of Governors of the Federal Reserve System, Automated Clearinghouse Services, http://www.federalreserve.gov/ paymentsystems/fedach_about.htm (last visited May 3, 2016). 86. Id. 87. Id. 88. Chris Morran, Pot-Centric Colorado Credit Union Sues Federal Reserve Bank for Denying Account, ConSumeriSt (July 31, 2015), http://consumerist.com/2015/07/31/pot-centric-colorado-credit-union-sues-federal-reserve-bank-for-denying-account/. 89. Fin. Crimes Enforcement Network, supra note 73. 90. Id. at 1. 91. Id. 92. Id. at 2. 93. Id. at 2–3. 94. Id. at 3. 95. Id. 96. Id. 97. Id. at 4. 98. Id. 99. Id. 100. Frequently Asked Questions Regarding 3 FinCEN Suspicious Activity Report (Question #16), http://www.fincen.gov/whatsnew/html/sar_faqs.html (last visited May 3, 2016). 90. Id. at 1. 91. Id. 92. Id. at 2. 93. Id. at 2–3. 94. Id. at 3. 95. Id. 96. Id. 97. Id. at 4. 98. Id. 99. Id. 100. Frequently Asked Questions Regarding 3 FinCEN Suspicious Activity Report (Question #16), http://www.fincen.gov/whatsnew/html/sar_faqs.html (last visited May 3, 2016). 101. Fin. Crimes Enforcement Network, supra note 73, at 4. 102. Id. at 5–7. 103. Id. at 4. 104. Id. 105. Id. at 4–5. 106. Memorandum from James M. Cole, Deputy Att’y Gen., to U.S. Att’ys, Guidance Regarding Marijuana Enforcement (Feb. 14, 2014), http://www.justice.gov/sites/default/files/usao-wdwa/legacy/2014/02/14/DAG%20Memo%20-%20Guidance%20Regarding%20Marijuana%20Related%20Financial%20Crimes%202%2014%2014%20(2).pdf. 107. Id. at 2. 108. Id. 109. Id. 110. Id. ernight.”). 118. American Bankers Association, Aba Statement on FinCEN Guidance (Feb. 14, 2014), http://www.aba.com/Press/Pages/021414FinCenGuidance.aspx. 119. American Bankers Association,supra note 48, credit-union-for-cannabis.html. 120. Memorandum, supra note 106, at 2. 121. Id. at 3. 122. American Bankers Association, supra note 48 (“the expectations set forth in the guidance are extensive and require financial institutions to adopt procedures to closely scrutinize all activities of a marijuana business”); see also Tony C. Dreibus, Mad Scramble in Nevada after Bank Retreats from Cannabis Industry, Marijuana Bus. Daily (May 19, 2015) (citing the decision of various banks to close accounts due to high costs of compliance with government requirements), https://mjbizdaily.com/mad-scramble-nevada-bank-retreats-cannabis-industry/. 123. Marijuana Financial Services Cooperatives Act, Colo. Rev. Stat. Ann. §§ 11-33-10 to 11-33-128. 124. Colo. Rev. Stat. Ann. § 11-33-106. 125. Before the commencement of operations, the incorporators of the co-op must provide written evidence of approval by the Federal Reserve System Board of Governors for access by the co-op to the Federal Reserve System. Colo. Rev. Stat. Ann. § 11-33-104. 126. Hill, supra note 14, at 639 (“Is the Federal Reserve likely to grant cannabis credit co-ops access to any of the Fed’s payment services? Most commentators say no, although few offer a precise legal basis for their conclusion”). 127. Id. 128. Colo. Rev. Stat. Ann. § 11-33-126(1)(a); Hill, supra note 14, at 642. 129. Colo. Rev. Stat. Ann. § 11-33-106(4)(a)(I); Hill, supra note 14, at 642. 130. David Migoya, Promise for Pot-Banking Co-Op SeesLittle Progress Since It Was Law, Denver Post (Sept. 14, 2014) (“’We get questions from interested parties, but no one has applied,’ said Chris Myklebust, Colorado’s commissioner of its division of financial services”), http://www.denverpost.com/marijuana/ci_26525249/promise-pot-banking-co-op-sees-little-progress. 131. Jenny B. Davis, Meet a Lawyer Trying to Guide the All-Cash Cannabis Industry into the Federal Banking System, ABA J. (July 1, 2015), http://www.abajournal.com/magazine/article/lawyer_dad_works_to_guide_all_cash_cannabis_industry_into_the_federal. 132. Nathaniel Popper, Banking for Pot Industry Hits a Roadblock, N.Y. Times (July 30, 2015), http://www.nytimes.com/2015/07/31/business/dealbook/federal-reserve-denies-credit-union-for-cannabis.html. 133. Id. 134. Fourth Corner Credit Union v. Fed. Reserve Bank of Kansas City, 15-CV-01633-RBJ (D.Colo. Jan. 5, 2016). Fourth Corner Credit Union filed an appeal to the U.S. Court of Appeals for the Tenth Circuit, Case No. 16-1016, and it is pending resolution as of this date. 135. Will Yakowicz, New Software Could Help Marijuana Businesses Get Access to Banks, Inc. (July 21, 2015), http://www.inc.com/will-yakowicz/kind-financialcannabis-banking.html. 136. Id. 137. Id. 138. Id. 139. 31 U.S.C.A. §§ 5312(Y) and (Z). 140. Hill, supra note 14, at 644. 141. Id. (citing FinCEN Director Jennifer Shasky Calvery when she conceded that marijuana banking is “a unique and complex issue” and “only legislative change can fully and completely address it”). 142. Pub. L. No. 113-235. 143. Id. 144. U.S. v. Silkeutsabay, 13-CR-0140-TOR-1 (E.D. Wash. May 18, 2015). 145. Id. 146. CARERS Act of 2015 (S. 683; H.R. 1538, 114th Congress (2015–2016)); Respect State Marijuana Laws Act (H.R. 1940, 114th Congress (2015–2016)); Marijuana Businesses Access To Banking Act Of 2013 (H.R. 2652) was reintroduced as Marijuana Business Access To Banking Act Of 2015 (H.R. 2076, 114th Congress (2015–2016)). 147. CARERS Act Of 2015 (S. 683, 114th Congress (2015–2016)). 148. CARERS Act Of 2015 (H.R. 1538, 114th Congress (2015–2016)). 149. Id. 150. Id. 151. According to Govtrack, a website that tracks the progress of bills in Congress, the prognosis for the CARERS Act is that it has a 1% chance of being enacted. H.R. 1538: CARERS ACT OF 2015, GOVTRACK.US, https://www.govtrack.us/congress/bills/114/hr1538 (last visited May 3, 2016). 152. H.R. 2076, 114th Congress (2015–2016). 153. Id. 154. According to Govtrack, the prognosis for the Act is that it has a 0% chance of being enacted. H.R. 2076: Marijuana Businesses Access To Banking Act Of 2015, Govtrack.us, https://www.govtrack.us/congress/bills/114/hr2076 (last visited May 3, 2016).